This was the moment that my son was waiting for all year. If you’ll recall, on my very first pos this year I noted that my son – who was eight – objected to this blog because it meant that we’d spend the year listening to Bob Dylan rather than to his favourite band, The Avett Brothers. “Without Bob Dylan there would be no Avett Brothers,” I told him. He was not impressed at all. He knew what he wanted, and what he wanted was not Bob Dylan. Yesterday we were doing some Christmas shopping and “Mr. Tambourine Man” came up on the display in the car. It was a cover version and my son sank back in his chair, pouting. “I only like it when Bob Dylan sings it”. Total victory in just eleven and a half months. Actually, my son recently announced that his favourite singers were Bob Dylan, Cat Stevens, Billy Bragg, The Avett Brothers, and Katy Perry. One of these things is not like the other…. Well, at the Grammys on February 13, 2011, two of my son’s favourite acts played together for the first time. I do remember watching this, but since there is no chance that I watched the Grammys live, I must have watched a streaming version online the next day, which is the preferred way to watch any awards show (just wait for the viral videos the next day, don’t sit through four hours of celebrity speeches). We start with Mumford and Sons. I started listening to them in that short period between the time the band released their album in the UK at the end of 2009 and the release of the album in the US in early 2010. I was put onto the band by my niece, who is much cooler than I am. She knew that I play the banjo, and so she wanted to alert me to this cool new band with a banjo player. For a couple of months I was the cool middle-aged man listening to the next big thing, and then they exploded and were everywhere, so I guess they’ve achieved total mainstream status now and are no longer cool for a middle-aged man. Oh well. Mumford and Sons were at the Grammys because they were nominated twice: Best New Artist and Best Rock Song (“Little Lion Man”) for their debut album, Sigh No More. The Grammy performance was one of the things that gave them a big career boost. Of course, two years later they won Album of the Year for their sequel Babel. The band has become a bit of a joke, at least in the circles that I move in, because they are hipsters (trucker cap and bowtie on your banjo player is going to lead to such charges). Their own self-parodying video for “Hopeless Wanderer” (starring Jason Sudeikis, Ed Helms, Will Forte, and Jason Bateman) showed that they were at least cognizant of the way that people think about them. They are criticized for the fact that their songs, including “The Cave”, which they play here, all sound the same (slow -> fast -> banjo). I don’t care, really, I still enjoy them, and I really came to like Marcus Mumford in the documentary about the music for Inside Llewyn Davis – which he closes by singing Dylan. That said, we missed seeing them when they played here last year – the show sold out before we were even aware that they were coming. Anyway, good opening by Mumford. I like the horns. When the curtain pulls back, we get the Avett Brothers singing “Head Full of Doubt, Road Full of Promise” from their album I and Love and You. The Avetts were one of the rare performing acts at the Grammys who were not Grammy nominees. They were booked on the assumption that they would be nominated, but then they weren’t stupid Grammys. I’m with my son: the Avetts are great. I’ve been a fan for many, many years. Their neo-bluegrass with post-punk influences is literally tailor made to make them my favourite band at this point in my life. I love their cryptic (Dylan-esque!) lyrics and their frenzied, funny performing style. I saw them headline the first night of the Calgary Folk Festival in 2010. I went with a friend who had never heard of them and by the end of that night they were close to being his favourite band as well – he’s even traveled to see them live without me, because that is the kind of lousy friend he turned out to be (still reading, Marc?). The Avetts are hipsters too (well, not bassist Bob Crawford – he always seems like he’s an accountant that has been kidnapped by two crazy brothers from North Carolina), but that doesn’t diminish my admiration for them in any way, and while they’ve made a couple of musical missteps in the past few years, I still wear my Avett Brothers t-shirt almost every weekend. Plus “Kick Drum Heart” is still my son’s favourite song. There version is “Head Full of Doubt” here is akin to the Mumfords: slow and soft -> fast and loud. It’s good, but I’ve seen them do it live better. 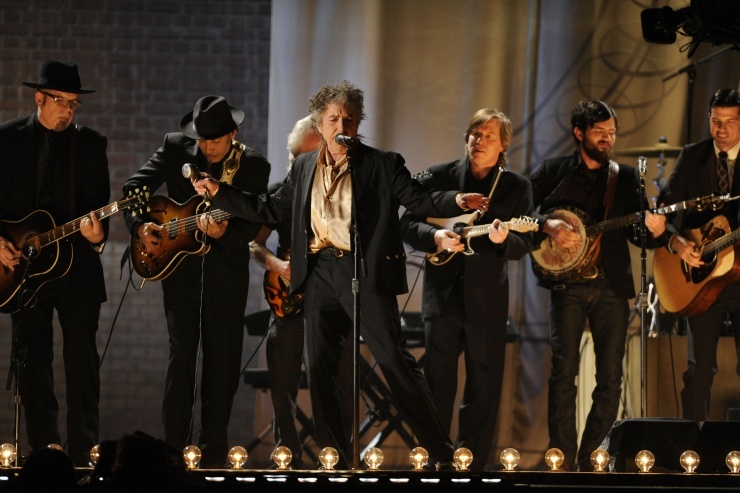 Then, finally, out comes ten time Grammy winner Bob Dylan and his touring band. Dylan stands in front of a line made up of the three bands, who play a lot of guitar, a lot of bass, and even two banjos as they belt out “Maggie’s Farm”. What can you say? Dylan is great here. My wife just trashed his singing and now we’re going to have get divorced. Look how happy Dylan is here! He prances! He plays harmonica! It’s great (though JLo seems unimpressed). Anyway, it’s a hootnanny. What is really great is how happy the other bands look – particularly the Avetts – to be backing up Bob Dylan at the Grammys. 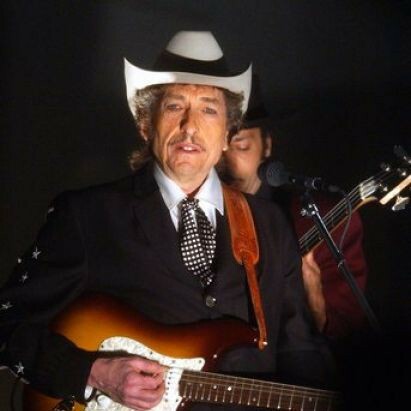 It must be quite a moment for any band working that style in 2011, since Dylan is the gigantic gravitational force in the solar system of Americana, post-folk, and even neb-bluegrass. My one knock on the whole thing is that I wish that they hadn’t had David Letterman introduce the whole thing. For me it would have worked better as a series of surprises, with the curtains dropping to reveal the next act, and then the next one. That’s not how The Grammys work though, and, besides, they pre-announced the fact that this performance would be on the show. Still, a little stage craft would have made this even better. A fresh $10 bill to the first person who can, in 2014 (or 2015 I guess, at this point in the year), define what a “hipster” is without eventually having to widen said def. to “someone under the age of 40”. If blogs had a “like” button, I would “like” this, but as it is I can only say that I liked this.